Evening guys,looking for a gunsmith in newport/bristol area to do some work on my tikka as I'm having issues with the screws for the rail that screw into the action. Think I might have damaged the threads trying to get them in. Presumably you mean the scope rail? The action is hardened AFAIK, so it's more likely that the screws are mashed. Had this with my M595.............thinking that as it's made in Finland, it would have metric threads instead of the yank abortions, I tried using M3.5 screws. The first one jammed and stripped, so I realised I had the wrong size...........the M595 action is threaded 6/48, whatever that means. Sorted it, though, just managed to winkle the spiral of stripped metal out of the hole, and got some 6/48 screws from Brownells. HPS-TR are up the M5 At Newent. Thanks,just dropped them an email. It is almost certainly a custom thread, based on UNF #6. UNF #6 is normally 40 tpi, but it is a custom at 48 tpi. 6-48 NS is most likely a Unified thread commonly used rifles especially American built. NC is Course, NF is Fine, NEF is extra fine, the NS stands for Special thread. Interestingly (and not looking for an argument on this, it is purely a nerd comment), as you say UNS, the Unified Specials, are basically anything that aren't NC, NF or NEF. However, and peculiarly, you won't find #6 - 48 on any list of UNS threads as they only start at #10-28. So, #6-48 is really a custom thread based on UN #6 diameter and thread form, rather than an actual UNS thread. It's a special, but it isn't UNS, it's a custom. The only reason I mention it is because if people go looking for a definition of 6#-48 UNS, they likely won't find it on any of the UNS thread charts . Machinery's Handbook is probably the definitive bible, and #6-48 doesn't appear on the UNS charts in my copy. Pretty sure uns is for big stuff where the tpi is fixed at 8, when above 1 inch regardless of diameter. I have a set of 6-48 taps and dies here that have NS on them. I would have thought with things called 'special' there would be plenty of variation around. 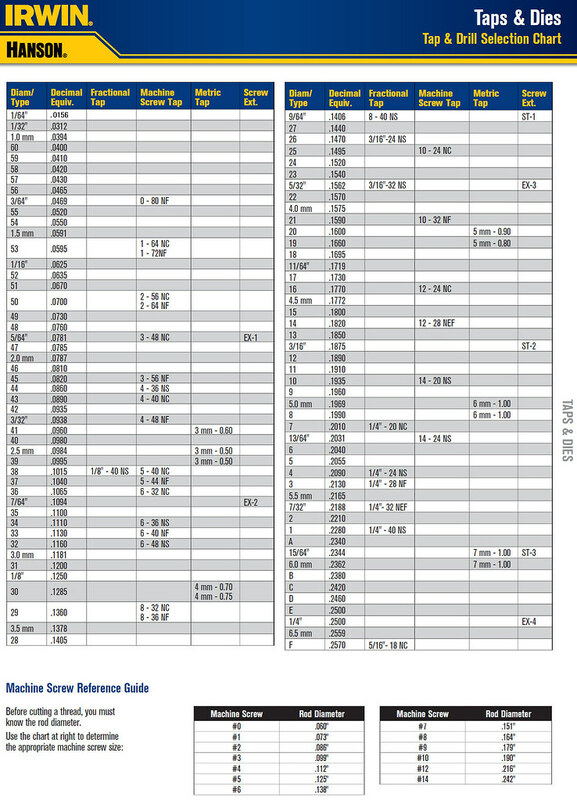 This is part of a chart I have from a supplier in the States (Lincoln Machine Tool IIRC). The Hanson chart goes from #4NS to 1/4"NS. Most charts I have found (Such as this one) start at #10 and go from there but apparently they go smaller and possibly bigger. UN (Unified) threads are American, with a 60 degree flank angle, imperial measurements. We have already established that the #6-48 referred to is 0.138" diameter (3.505 mm), 48 tpi. Despite the misnomer, the British Association thread form is actually of Swiss origin, and is a metric thread form. 6BA is 0.110 diameter (2.8 mm), pitch is 0.53 mm, flank angle is 47.5 degrees. I noticed that the conversion of 6 BA to imperial was 47.92 tpi, and suspected that was what made you think of it.